Bluetooth Low Energy has the two great features: minimal energy consumption and it is supported in almost every smartphone. Indoor positioning systems based on BLE could generate signals for months or even years autonomously, is extremely easy to use and it is cost effective. These features attract attention to indoor navigation based on Bluetooth Smart. How could such positioning be implemented? 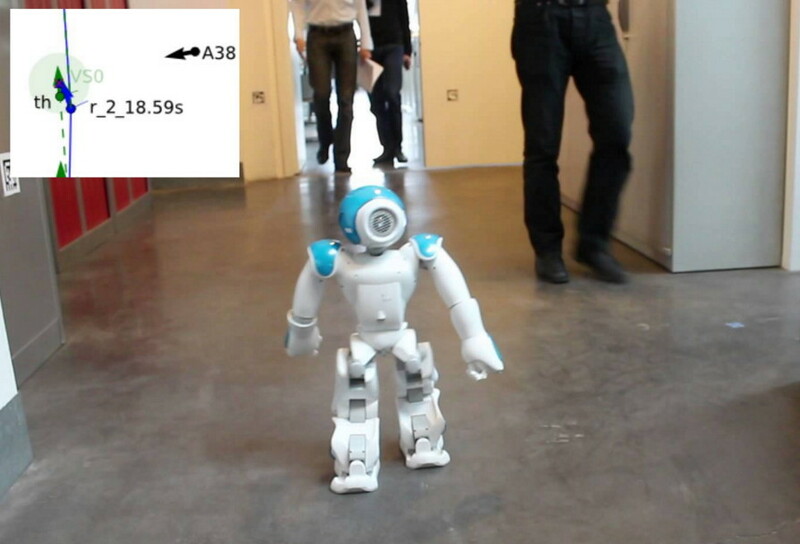 What are the limitations that BLE brings to indoor navigation? But first, what is the most important purpose of using indoor navigation at all? GPS signal is the best solution for outdoor navigation. But the strength of a GPS signal often degrades significantly inside buildings or underground. You can observe this effect yourself when you compare the responsiveness of mapping Apps in a tightly packed urban environment with high buildings vs. on the open road. Another issue is moving short distances among numerous blocks that are typical for a building. An indoor positioning system should be able to detect an object with very high precision. Changes in motion variables should be tracked almost instantly so an object couldn’t bump into a block. Because of Internet of Things has gained popularity indoor navigation has become more popular too. 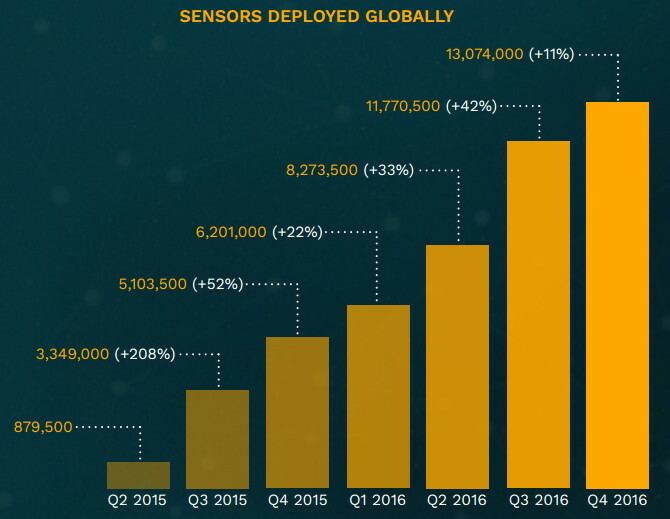 By the end of 2016 in the world over 13 million proximity sensors were deployed. This represents 2x growth over one year. It includes all types of proximity sensors; BLE, WiFi, NFC, Visible Light Communication – VLC, geo-magnetical to name a few. There are at least 15 implementation methods that have been used to set up an orientation in a building. Some of them are quite exotic like the empirical method or grid concept. For practical usage the best solutions are Bluetooth Smart and Wi-Fi. Wi-Fi is good and the use of its applications have risen for indoor navigation. But BLE remains the most popular technology for this purpose. BLE proximity sensor technology leads the pack when you compare it with other similar technologies. At the end of 2016 8,039,500 beacons, 2,921,500 Wi-Fi points and 2,113,000 NFC sensors were registered in the world. Indoor navigation has been implemented in airports, railway stations, shops, museums, tourism, offices, exhibitions, warehouses, hotels, hospitals, stadiums and other places. An indoor positioning system that is based on BLE is implemented by beacons. A beacon is a small electronic device consisting of a chip and other electronic components (e.g., antenna) on a small circuit board. A beacon is just a radio transmitter that sends a signal. This signal could be caught by devices that are equipped to receive it (like smartphones). Beacons broadcast short-range signals that can be detected by apps on mobile devices in close proximity. Now iBeacon and Eddystone are the most popular standards. Also there are some alternatives like URIBeacon, ALTBeacon, Open Beacon but it does not seem like these alternatives are popular. Usable with both client-based as well as server-based applications. In general beacons should be tuned before practical usage. Many well-known vendors also provide specific software that help you to do it quickly. Also there are many third party applications that you can use to change beacon behavior. A few beacons are set inside a building. An application finds these beacons and gathers their RSSI readings. The distance between the receiver and each beacon is calculated. If the app hasn’t received any information it uses a gyroscope and compass integrated in the mobile device. This data is used to determine in which direction a user is moving. 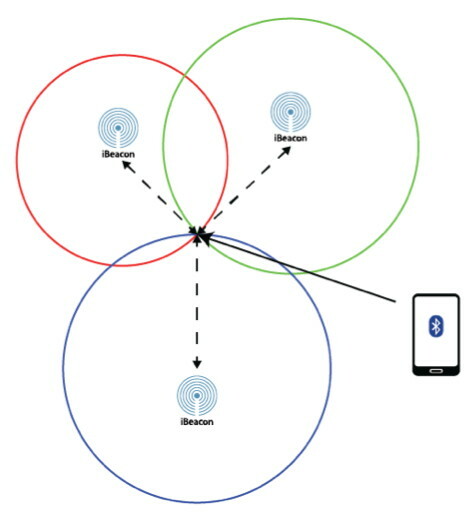 Both the beacons’ and the user’s position, as well as the distance between them are shown in a map. Indoor navigation based on Bluetooth Smart technology could be applied in the following cases. Relatively low precision. Practically beacons could define the orientation of an object with 1-3 meter accuracy. Is is not enough for some functions such as determining the location of small spare parts in a warehouse. The solution is to use Ultra-Wideband technology that defines a location with 10-30 cm accuracy. Additional hardware. Beacons are must-have tools to organize BLE-based indoor navigation. Big projects with hundreds of beacons will require significant expense. App creation is required. For client based solutions an application should be developed and installed on client’s mobile devices. Relatively small range. At best a beacon will be able to broadcast a signal up to 30m. But this distance in real conditions is likely be much smaller because of barriers such as walls and signal noise. The Bluetooth 5 specification improves possibilities for future BLE-modules. The range should be increased up to four times, and broadcast messaging capacity to eight times. 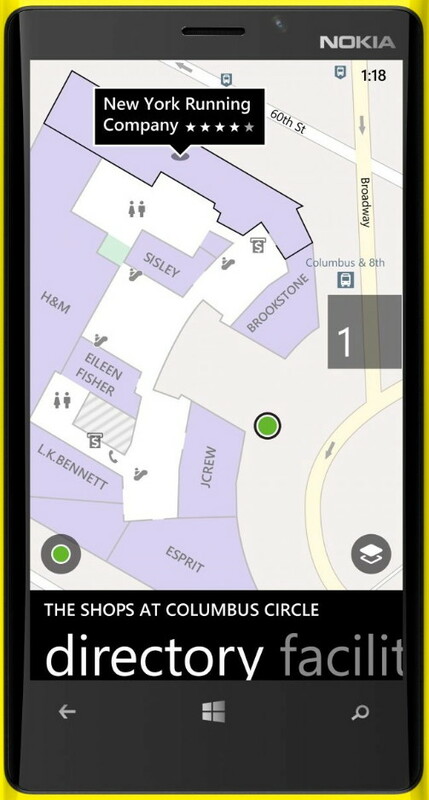 Perhaps you are interested in some of the basic aspects of indoor navigation. It relates both to Bluetooth and other methods of indoor orientation. In the following sections we try to gather the essentials about how indoor navigation works now and it could develop in the near future. There are a set of services that use existing sources of signals like WiFi or Bluetooth to map an indoor space. Mobile devices pick up signal points and define the user’s locations on a real-time map. An accuracy of 2.5m could be reached and enhanced by utilizing the device’s compass and accelerometer. Different companies like Microsoft, Google, Nokia, Apple, are deploying the technology in a number of hospitals, shopping malls, airports, shopping malls, and major convention centers. Client based. A specific application should be installed on a smartphone. It receives signals from beacons, calculates its position and does its operations accordingly. Client based positioning is good when a receiver should do (or not do) operations according to its current location. The client-based method is the most suitable for museums, retail, airports. A relative disadvantage of this method is it works only with an application. So users would be required to download an app. Server based indoor positioning does not require a client with the specific app. Instead, a person should have a tag (or slim beacon). The tag/beacon advertises their MAC address or UUID. This signal is captured by specific hardware which is then transmitted to server for calculating and gathering statistics. The server based approach is good for tracking assets and moving objects like goods, vehicles, medical equipment in a clinic or for personal tracking applications. Internet Based Indoor Navigation Services. Further development for indoor navigation has introduced a new branch called Internet based indoor navigation services (IIN). The main idea behind it is to consolidate different local indoor objects that are already mapped. IIN services rely on geolocation databases that store indoor models comprising of floor-maps and points-of-interest along with wireless, light and magnetic signals used to localize users. Developing IIN services creates a new spectrum of information management challenges ranging from crowdsourcing indoor models, acquiring and fusing big-data velocity signals, localization algorithms and the location privacy of servers. Radio Frequency (RF) signals broadcasted by wireless devices are used differently depending on the positioning method. During the few last years, several of these methods have been developed. The two most common positioning methods are fingerprinting and triangulation. Both of these are based on RSSI. Received Signal Strength Indicator (RSSI) is a signal parameter that uses of the power present on a received radio signal expressed for measurement. RSSI is measured in dBm. The lowest usable signal is equal to -100 dBm then the value rises according to signal strength. Fingerprinting uses the RSSI generated by a group of devices to create a signature (Fingerprint) of a specific location. The values include the addresses of devices which are stored in a database. Once several “Fingerprints” of different locations are created, continuous scans are performed and a runtime Fingerprint is generated for each scan. The last scan is then compared to the previous scan that was stored earlier in order to obtain the closest match that represents the user’s location. Triangulation uses RSSI for calculating the distance between receivers and beacons. This method works when three or more beacons are each generating a signal. Distances to the reference devices are roughly calculated. Distance calculations are very customized for both cases and consider some local factors. But in general there are formulas and approaches that help to obtain distances in certain points. Both the Fingerprinting and Triangulation methods are easy to implement and have been proven to work. Machine learning is a field of artificial intelligence dealing with algorithms that improve performance over time with experience. This approach provides a fast, efficient method for indoor tracking, which will often be more useful to applications than static localization. Also a hybrid approach is suitable for live deployment, which presents a possible solution for algorithms whose calculations are too slow for real-world use. Some algorithms are capable of providing an accuracy of up to 0.76 meters. Obviously, the indoor navigation segment growth is not increasing as rapidly as the IoT segment. BLE technology is still the most popular form of implementation for indoor positioning systems. Because it is inexpensive, precise and can work for a long time without charging. The main method used to organize navigation inside a building is the use of beacons, although there are different possibilities such as machine learning to create recognizable space without using GPS signals. Images are used in this article: youtube.com, Proximity.Directory_Q4_report.pdf, slideshare.net, the-reference.com, infsoft.com, theprimacy.com, beacon.it.